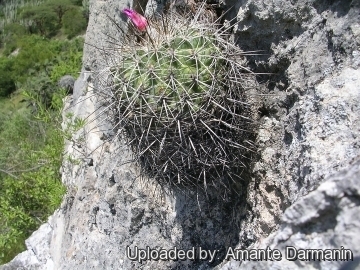 Origin and Habitat: Turbinicarpus horripilus is endemic to Mexico (Hidalgo: Metzitlán). The extent of occurrence is less than 100 km², the species certainly occurs in less than five locations, and the population size is estimated from 1,000 to 3,000 mature individuals. There is less than 1 individual per square meter. The few subpopulations are continuing to decline due to illegal overcollecting. Altitude range: 1200-1500 metres above sea level. Habitat and Ecology: This species grows in semi-desert scrub vegetation in rock crevices and steep slopes among calcareous rocks. 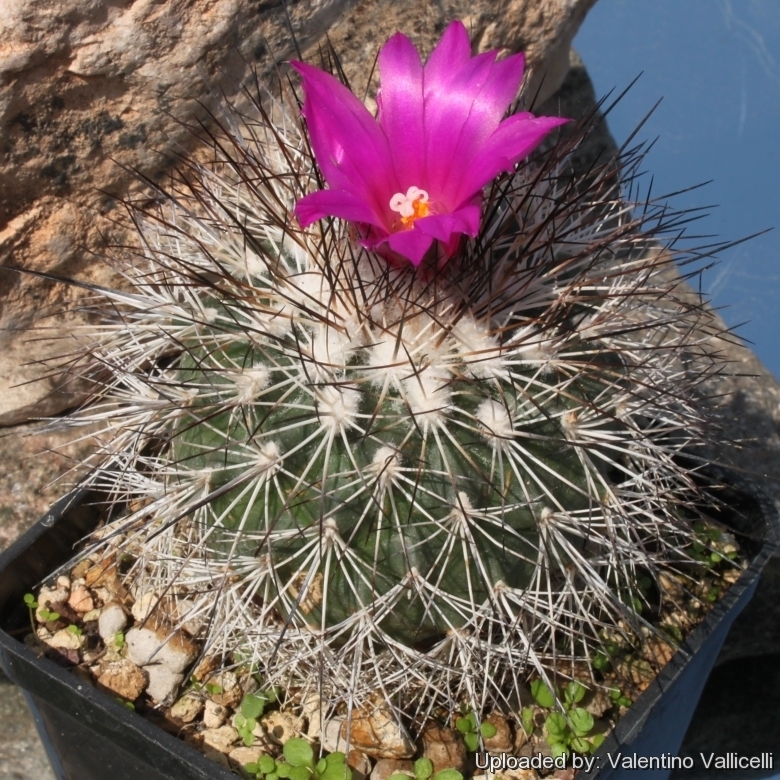 In the same area it is possible to find several cactus and succulent species like: Mammillaria geminispina, Mammillaria candida, Myrtillocactus goemetrizans, Cephalocereus senilis, Stenocereus dumortieri, Opuntia durangensis, Tillandsia recurvata, Agave stricta and Agave salmiana. Illegal collecting continues to threaten this species. 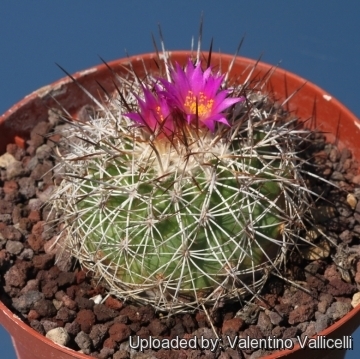 Turbinicarpus horripilus var. wrobelianus (Nitzschke & Montes) D.Donati & Zanov. 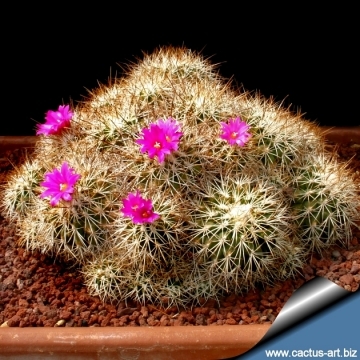 Description: Turbinicarpus horripilus, formerly known as Gymnocactus horripilus, is a small, slowly clustering, globular to roughly columnar cactus. Tubercles: ± Conical, compressed at the sides, rhombic at the base 5-7 mm high. Areoles: Oval, with much white wool, very soon becoming bare. Radial spines:8-15 rigid, 9-11 mm long, radiating, straight or (rarely) somewhat bent, intertwined in each other white with brown tip. 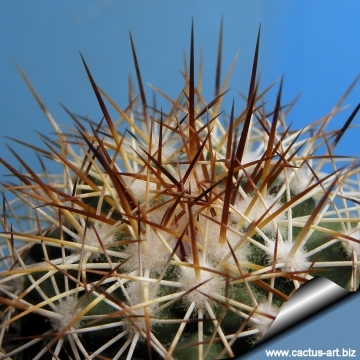 Central spines: 1-2 rigid, pungent up to 3 cm long, dark brown becoming greyish white, blackish tip. Flowers: Diurnal deep purple with whitish throat, up to 4 cm in diameter. Blooming time: Spring and summer. Fruits: Greenish-red becoming yellowish-brown 4-6 mm long, 3-5 mm wide. 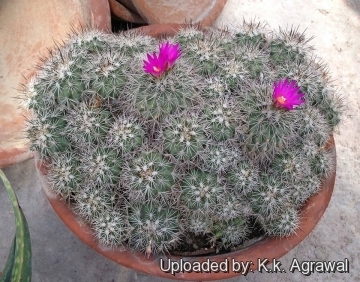 Turbinicarpus horripilus (Lem. ex Förster) V.John & Říha: Pungent pale to dark brown spines with blackish tip that become greyish white, areoles with white wool (when young), soon becoming bare. Turbinicarpus horripilus f. monstruosa: It forms dense clusters, composed of a great number of soft green stems, each of them usually less than 2 cm wide, some only a few mm across. The spines are all radials: 1-3 mm long, bristle-like, somewhat bent. 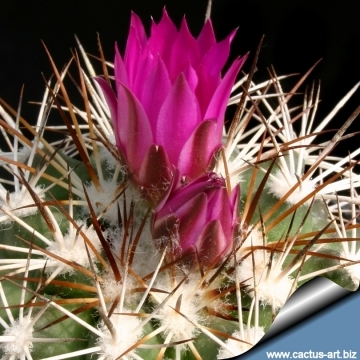 Turbinicarpus horripilus subs. wrobelianus Nitzschke & Montes: has almost white radials and darker brow to black central spine (versus tan to brownish spines), and a little smaller flower. Distribution: North of Metztitlan near Jilos (Gilo, Xilo), Hidalgo, Mexico. 4) Guadalupe Martínez, J., Fitz Maurice, W.A. & Fitz Maurice, B 2013. 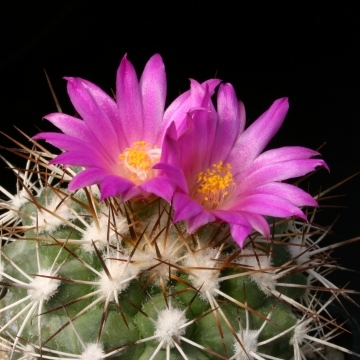 Turbinicarpus horripilus. The IUCN Red List of Threatened Species. Version 2015.2. <www.iucnredlist.org>. Downloaded on 09 August 2015. 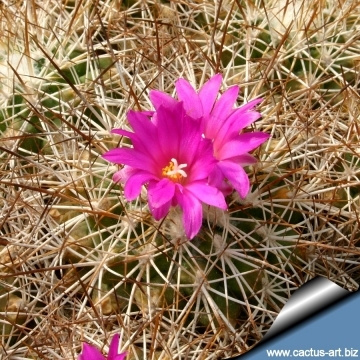 Cultivation and Propagation: Cultivation: It’s a fairly easy species to cultivate and relatively fast growing. Need a very well drained soil. Requires strong sun to part sun to develop good spinal growth and waterings should be rather infrequent to keep the plant compact and not to become excessively elongated and unnatural in appearance. Careful watering away from the body of the plant will allow the areoles to keep their wool. keep dry in winter or when night temperatures remain below 10° C, it is hardy to -4°C for a short period. Assure a good ventilation.